A young girl's feet in Mong Kok. The facade of an abandoned ​structure in Causeway Bay. Protesters built supply and first-aid stations near the encampments. Various messages for freedom and democracy were posted around the city. 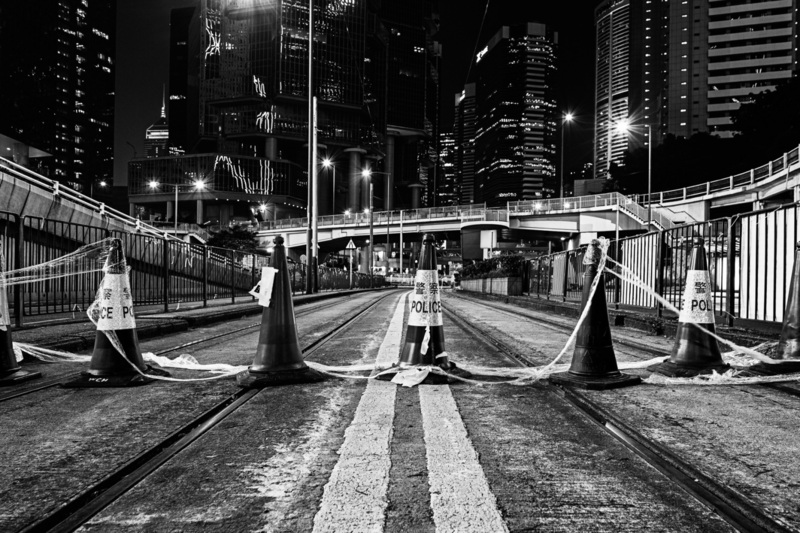 Barricades placed directly in front of the Bank of China in Causeway Bay. A passerby in front of the Lennon Wall in Admiralty where the entire stairway is filled with messages of support. An afternoon at Harcourt Road. Road reflectors were destroyed and replaced with plants along the Harcourt Road flyover. Disagreements between citizens were often the cause of ​the crowd's attention​. Protesters encamped in front of the Legislative Council in Admiralty. They built a makeshift library open to all. Police in Mong Kok were stationed merely to maintain order. The protests fueled a lot of intense conversations among the citizens. Afternoon nap at Yau Ma Tei. A quiet street in Sham Sui Po.